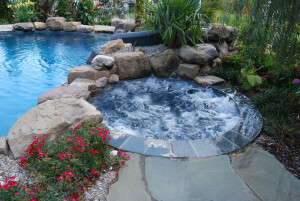 There are many pool & Spa Options to enhance not only the beauty but the function of your inground swimming pool. Below is a list of different options that can add to the enjoyment and relaxation of the swimming pool. Although there is a large variety of options remember that if you can dream we can build it. 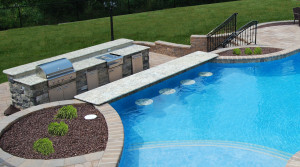 Nothing adds to the amount of relaxation you can receive from your inground swimming pool design like an attached spa. Imagine coming home after a hard day and letting the bubbling water and jets relieving the stress of the day. Spas can come in all shapes and sizes and that is where your Swim-Mor Pools Deisgner will help mold the spa to fit your pool design and therapeutic and relaxation needs. Waterfeatures added to your inground swimming pool will add excitement and create an eye-catching spectacle to your pool. There are many options that are only limited by your imagination. From gusher frothy fountains and LED laminar jets to flowing rock waterfalls and sheer descents. 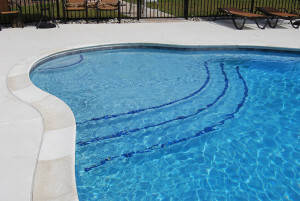 Your Swim-Mor Pool Design consultant can help you with designing the feature that best works with your imagination in creating your own backyard paradise. From viewing the pool photos page you can see some of the different tile and coping on the swimming pools. 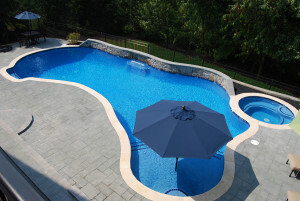 Below are some of the options you can choose for the details on the pool. Please keep in mind that these materials vary in shade, color and thickness and also that not all the tile and coping below is part of the standard selections and can vary in price. 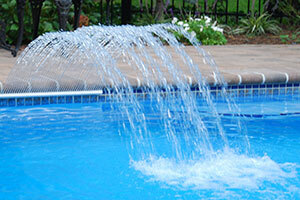 Please check with your Swim-Mor Pool design consultant for availability and pricing. When designing your Swim-Mor Pool please think outside the box on just how much you can potentially use your pool. Think of yourself lounging comfortably, reading a book while your drink sits safely on a the table inside the pool; gathering around the table, having a drink, playing cards, eating your sandwich, inside the pool; just went on vacation and loved the idea of bellying up to the bar inside the pool. As we said before, if you can dream it we can build it. See some of the options below that will add your enjoyment of your own backyard paradise. Adding a Sun Shelf as part of the swimming pool is an excellent way to stay cool on hot days without having to go completely in the pool. Sun Shelves range from 3” to 18” deep but are typically left at 6” allowing you to sit in a lounge chair under an umbrella in the pool keeping cool. It is also a great place for small children to play under your supervision.